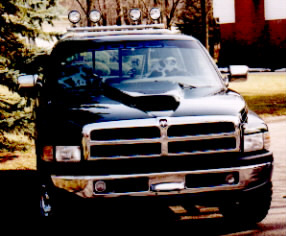 After a little over 5 years of owning it, my '96 Dodge Ram 1500 SLT is now up for sale. It is 2WD, regular cab, short bed, and powered by a 5.9L with a 4 speed automatic transmission. There are about 148,000 miles on the engine, and the trans was just rebuilt about 800 miles ago. The engine still runs good and strong. It is equipped with Edelbrock headers, Dynomax mufflers, and a 2.5 inch full dual exhaust. The intake side of the engine is fed by a functional ram air inlet. Truck also has power sunroof, keyless entry, remote starter, side steps, fog lights, towing package, driver side airbag, cruise control, A/C, power steering, power locks, power windows, and sliding rear window. The roll bar setup seen in the pictures are still on the truck, but the lights have since been removed. I am asking $4,000 OBO. I can be contacted by phone at (734) 612-6366 or email at andrew.koritnik@us.bosch.com.